I think they may be similar to the ones used in AdaFruit's Ice Tube clock. Take a look at the information there and see if it sheds any light on the situation. Numitrons have an incandescent filament for each segment, but from the datasheet and IanB's video above it seems to be a regular VFD. Filament voltage 1.2v @ 50mA, plate voltage 27V continuous 60V pulsed. Soviet IV-6 (? ?-6) is a regular VFD. (In fact, IV-** denotes an VFD, "IV" stands for Russian "Indicator Vacuumnyi" in Russian, no translation is needed, I think ). However there are two or three models that have IV-** marking but are no VFDs, nobody knows why. Just like any other VFD, IV-6 is operated just like any vacuum triode. Filament voltage is 1.2 V rated, voltages between 1.0 and 1.35 V are permitted. Pins 7 and 8 are filament and directly heated cathode. A positive voltage should be appliet to the grid (pin 9) and anodes (all other pins). Pin 12 is cut and used for a key. Each anode corresponds to a segment, and manipuulating grid voltage can be used for multiplexing. Rated anode voltage is 27 V (25 to 30 V) and 0.5 mA constant current. But it works even at 12V or less so you may use regular 40xx series ICs with them. Simpliest usage: apply 1.2 V between pins 7 and 8, connect pin 8 to ground. Apply positive voltage 12...27V to pin 9 and to one or more other pins. You may connect pins 1-6, 9, 10 and 11 directly to outputs of 40xx logic. Can you please tell me how to identify the pins? Did you look at the page you linked to? 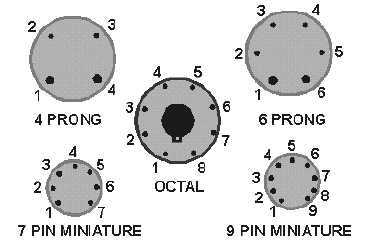 All glass tubes, valves, older ICs in round metal cases and other round devices almost always have the same pin numbering: clockwise if seen from bottom (from pin side). There is some space (cut pin) between pin 1 and pin 11. Other devices may have no such space but they always have some other key, i.e. a color dot near pin 1. I hack with the battery in..
me to vdf IV6 how can i use them or 1 with an UNO just as a clock with the DS1307 TRC?? just 1 tube so how to conect it? there is a build online but it is the IV9 low power nixie build as the 7 segment display, so the tube works as that, but when i ordered the tubes the builder told me he made a mistake and that the tube was a IV9 the f m.... yep. so how can i still use it in that config?